Too often, we pronounce something to be a failure way too soon. Corporations that rely on quarterly business cycles, or even yearly bonus cycles, sometimes feel forced to make quick decisions about the potential success of a given strategy. In doing so, they fail to pivot, fail to iterate, fail properly measure, fail to listen to their customers, and fail to succeed. Even when you look at personal projects, you often see a hint of what could be, if only there is enough passion to wait out the failure. Everyone is a failed writer before they are a successful writer. To be okay when things become grim, when failure surrounds you, envelops you, and holds you down beneath the water – it takes an incredible sense of perseverance. Those who wait it out may find that success is just around the corner. Maybe patience was all that was needed, or a shift in the business model, or the right partnership or market timing. Entourage: The show’s creators had to wait something like two years from the deal with HBO to actually getting a pilot on the air, and then another nine months for the series to actually begin. Plus, there was the time they spent trying to sell it to HBO before the deal was even signed. Again and again in he commentary track, you can hear it in their voices – how tentative there success was in the beginning, how it took a series of two steps forward, one step back type situations. Their success relied on so many factors, not just having a great idea and some connections. Good Will Hunting: They had a very similar story, it took something like five years of work to slowly get people to support the project, to keep iterating and changing to make it better. Even when big names were attached, the movie wasn’t a done deal – it was constant effort to get someone to recognize it. That it was nominated for and won Academy Awards can mask this uncertainty – a success can often seem like a foregone conclusion after the fact. And of course, what follows is tons of people say “I had that idea,” as if they idea alone was all it took to bring the movie into existence and make it a success. Sometimes we rush to failure. There is fear embarrassment if something isn’t an instant success, and it is easy for people to give in to self-doubt, allowing others to define their experience, and their value. Anything great that was ever achieved was likely wholly different than anything that came before it. It challenged others before it inspired them. When we give in to failure too easily, we give in to mediocrity, to the leveling of new ideas down to the accepted middle. And if there is one thing we need – it’s people shooting for those great inspiring goals – of birthing something that has never been before, but the world desperately needs. 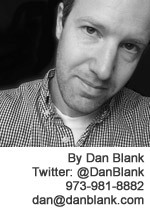 Let me know if I can help you in achieving your goals: @DanBlank, 973-981-8882 or dan@danblank.com.